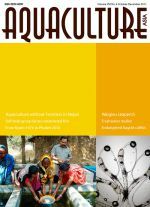 Many attempts to extend small-scale inland aquaculture have been made so far in many parts of Asia and some parts of Africa. According to lessons learnt from these experiences, stable seed production is the most decisive factor to develop freshwater fish farming in poor rural areas. Seed production technology, with ensuring the supply of good quality brood stock, should firmly be built. Seed production will be highly commercialised, contributing to a growth of local economy. NACA was selected by the World Bank to implement a 6 day training program on "Good Aquaculture Practices" in Surabaya, Indonesia from 17-22 June 2013 under the on-going World Bank Global Food Safety Partnership initiative. The objective of this training was to deliver a certificate level food safety and supply chain management training program on design and implementation of good aquaculture practices through the supply chain including food safety management systems and HACCP. A second trip to Hubei Province, central China. Sea cage growout of cobia Rachycentron canadum in the Gulf of Mannar. 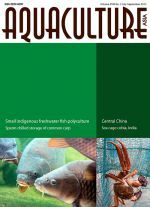 Culture of small indigenous fish species in polyculture with Indian major carps and high value crops along pond dykes. Study on sperm chilled storage of common carp Cyprinus carpio in Vietnam. Culture-based fisheries exchanges between Lao PDR and Cambodia. Culprit behind massive shrimp die-offs in Asia unmasked. 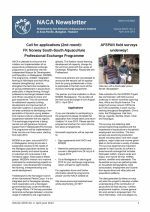 Call for applications (2nd round): FK Norway South-South Aquaculture Professional Exchange Programme. AFSPAN field surveys underway! 4th Global Symposium on Gender in Aquaculture and Fisheries. An anti-viral treatment for healthier black tiger prawns. Jungle perch on the comeback trail. Nursery management of grouper: A best-practice manual (Indonesian translation). Hatchery management of tiger grouper (Epinephelus fuscoguttatus): A best-practice manual (Indonesian translation). Priority adaptations to climate change for Pacific fisheries and aquaculture: Reducing risks and capitalising on opportunities. Improving biosecurity through prudent and responsible use of veterinary medicines in aquatic food production. To provide food to the world’s population in 2050, it has been estimated that agricultural output, primarily from crops, livestock and fisheries, including aquaculture, must increase by 60 percent. Intensification of aquaculture is inevitable in the face of increasing demand, limited land areas, and improved technology. Whether we are able to accomplish this in a sustainable manner will depend on global governance and stewardship as much as on technological progress. 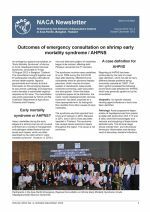 Outcomes of emergency consultation on shrimp early mortality syndrome / AHPNS. Workshop on Aquaculture Planning and Management Tools. 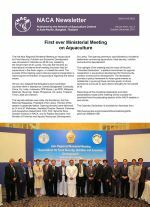 Workshop on Proficiency Testing Programme for Aquatic Animal Disease Diagnostic Laboratories in Asia-Pacific. AFSPAN Project gets underway. 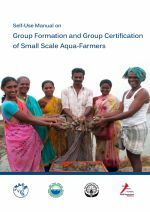 This manual is intended for the use by the current and prospective small-scale farmer groups who are interested in obtaining accreditation for their production process. The objective is to provide them an easy-to-follow, stepwise guide that can be used as a practical tool in their venture of attaining group certification. However, this can be used by the field extension officers and certifiers who are directly involved in the process or other interested parties. Visit to the AwF funded small-scale aquaculture project in Nepal. Success story of the Barakhandapat Ornamental Fish Breeding Unit, India. From Kyoto 1976 to Bangkok 2000 and Phuket 2010: Aquaculture development and personal transitions. Embryonic and larval development of Waigieu seaperch Psammoperca waigiensis. Culture feasibility of freshwater mullet Rhinomugil corsula in ponds in India. Management in seed production of an endangered catfish Horabagrus brachysoma during its hatchery phase. First ever Ministerial Meeting on aquaculture. Keynote address delivered by His Excellency, Mahinda Rajapaksa, President of Sri Lanka. Farewell Sena and welcome Eknath! 2nd Regional Training Course on Application of Business Management Principles in Small Scale Aquaculture. Consultation on Lake and Reservoir Fisheries and Aquaculture Development in Asia. Asia Regional Seminar on Certification for Small Scale Aquaculture in Thailand. Special issue of the AFS Journal: Integrated technologies for advanced shrimp production. 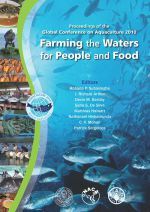 Farmers as Stakeholders in Commercial Aquaculture: Free download. Marker for banned antibiotic naturally occurs in freshwater prawns and other crustaceans.